i. Facility to book reserved tickets online upto 365 days in advance available in Executive Class/1st AC/2nd AC in all trains including Shatabdi/Rajdhani/ Duronto/Gatiman etc. ii. Fare equivalent to 1.5 times the base fare and other charges like reservation fee, superfast charges etc. are realised. IRCTC collects enhanced charges of ` 200 per ticket. iii. For booking the tickets, the Passport Number, Nationality and the international Mobile Number of the passengers have to be mandatorily entered. iv. No concession is admissible on such tickets. v. Payment is to be made only through international debit/credit cards. An SMS confirming the reservation of the ticket is sent to the registered mobile number. vi. 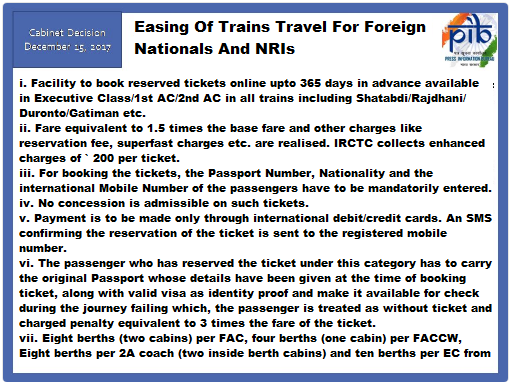 The passenger who has reserved the ticket under this category has to carry the original Passport whose details have been given at the time of booking ticket, along with valid visa as identity proof and make it available for check during the journey failing which, the passenger is treated as without ticket and charged penalty equivalent to 3 times the fare of the ticket. vii. Eight berths (two cabins) per FAC, four berths (one cabin) per FACCW, Eight berths per 2A coach (two inside berth cabins) and ten berths per EC from the general quota berths available in these classes are made available for booking 365 days in advance. viii. In case the party seeking berth is more than the available foreign tourist quota, the confirmed accommodation is provided up to the limit of foreign tourist quota and the remaining passengers are registered and provided confirmed accommodation on the opening day of reservation. However, with a view to ensuring compaction, berths/seats can be booked in this quota upto 365 days in advance and seat/berth is provided only at the time of opening of reservation as per Advance Reservation Period (ARP) subject to availability. However, fare for all such berths/seats is charged 50% extra of the base fare. ix. In case of cancellation of the tickets booked under this facility by the passenger, flat 50% of the fare is deducted in addition to the cancellation charges applicable while refunding the amount. The time limit for granting 50% refund is as per extant rules i.e. upto 4 hours before scheduled departure of train, through website only. x. No change of name is permissible on such tickets under any condition.